Schools almost out and the weather is warming up! Kids are playing outside but so many of them don’t have the proper equipment they need to stay safe – like bike helmets. 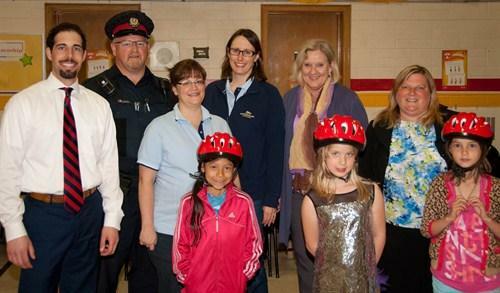 Thank goodness for organizations like The Bike Helmets on Kids Community Partnership that was started by the Ontario Trial Lawyers Association in 2002. This program is intended to put a helmet on the head of every child who needs one, and provides education and awareness about bicycle helmet use. Local members of OTLA generously give their time and money to both organize these community partnerships and fund the cost of the bike helmets. This year, a lucky group of 25 Grade 2 students at King Road Public School in Burlington were treated to brand new bike helmets and a fun, interactive presentation about the importance of wearing them. Laura Hillyer, of Martin & Hillyer Associates in Burlington, organized the event in association with OTLA (Ontario Trial Lawyers Association) and BIAPH (Brain Injury Association of Peel-Halton). It is the fourth year running that Martin & Hillyer Associates have run a Helmet on Kids Campaign for local children. Leah May from Martin & Hillyer Associates led the presentation which included educating the students on the importance of protecting their brain from injury by wearing a helmet. It was explained that your skull is the mere width of 3 pennies, and then an eerily life like jello brain was introduced to get an idea of how delicate their brains are, and how much more protection they should really have! The grimaces were also amusingly met with delight to ‘the brain’s’ lovely fruity scent, but the point was clearly made as students dug their fingers into the soft slimy matter! Just to drive the importance of wearing your helmet home further, a melon drop was performed! James Page, a lawyer at Martin & Hillyer, graciously climbed a ladder where he then dropped a melon wearing a helmet off the top – the melon landed safe and sound! He then climbed the ladder with another melon that wasn’t wearing a helmet and dropped it off the top with a SPLAT!!!! The kids enjoyed the demonstration but also saw the damage that can happen to your skull and brain if you don’t wear your helmet. Local community police officer Peter Panagabko of the Halton Regional Police also assisted with the presentation speaking further to the children regarding the law and our responsibilities and reiterated the intended message in a fun and friendly way. All of the students were then shown how to properly wear a helmet and then promptly fitted with their own brand new bike helmet courtesy of four local law firms; Martin & Hillyer Associates, The Munn Law Firm, MacDonald & Swan and Brechin & Huffman. 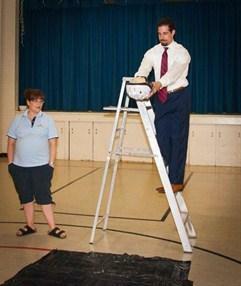 In total, the law firms donated 190 helmet to King Road Public School and to Halton Children’s Safety Village. Jorun Rucels of BIAPH was also in attendance and assisted with the fittings alongside Officer Peter Panagabko and lawyers, Laura Hillyer, Claire Wilkinson, and James Page of Martin & Hillyer Associates. 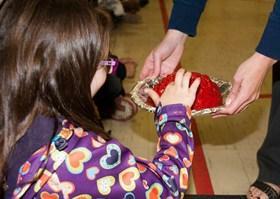 We would like to thank everyone who assisted with the event and we look forward to another successful campaign in 2014! James Page – Lawyer at Martin & Hillyer Associates, Officer Peter Panagabko – Halton Regional Police, Leah May – Martin & Hillyer Associates, Laura Hillyer – Lawyer at Martin & Hillyer Associates, Jorun Rucels – BIAPH, and Claire Wilkinson – Lawyer at Martin & Hillyer Associates.